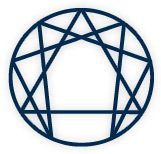 The Enneagram (pronounced any-a-gram) figure is a circle inscribed by nine points. In Greek, ennea means nine and gramma means point. Each point portrays a distinctive personality style that has its own way of viewing, construing, and responding to people and events. Each style has both adaptive or resourceful and non-adaptive or non-resourceful cognitive, emotional, and behavioral strategies for self-maintenance and enhancement, for interpersonal relating, and for problem solving. This array can be compared to a wheel of colors. If you shine light into a prism, it fans out into a spectrum of the basic colors. Following this metaphor, every person contains all the hues of the spectrum although one color particularly stands out or characterizes each individual. From a psychological perspective, human nature is expressed in nine natural fundamental ways; from a philosophical viewpoint, being is disclosed through nine essential characteristics; from a spiritual point of view, divinity descends and shows itself through nine earthly manifestations. The Enneagram is a useful tool for understanding both the “upside” and “downside” of our personality styles.